but when I hit ng serve I am getting the below error in browser console..
NullInjectorError: No provider for AngularFirestore! then ng serve, and I am getting the above error..
You should add providers: [AngularFirestore] in app.module.ts. I had same issue and below is resolved. Give it a try, it shall now work. 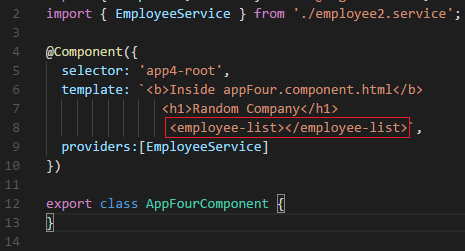 It turns out I had two classes in different components with the same "employee-list.component.ts" filename and so the project compiled fine, but the references were all messed up. Not the answer you're looking for? Browse other questions tagged angular angularfire2 or ask your own question. Inject service in provider Angular 5?